MR FAB & RIAA: "IT IS 2 LAFF!" 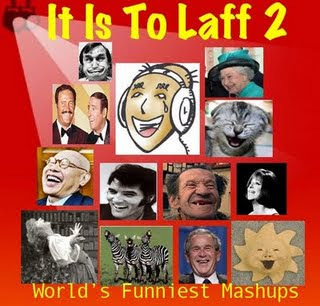 a various-artists collection of funny mashups, the sequel to last year's original "It Is To Laff." Our tune (recorded under an assumed name) "Dead Like Me" features our revenge on that horrible Pussycat Dolls song "Don't Cha," mixed with The Cyrcle/Paul Simon's "Red Rubber Ball," some L.A. Dream Time ("...is in the house"), some goofy version of Blood Sweat & Tear's "Spinning Wheel," the robot from the '50s film "Colossus: The Forbin Project," Raymond Scott's "Powerhouse," and lots and lots of wacky! comedy! samples! You really shine with your contribution.An instant classic! Love that stingray line! Rofl! The download numbers are soaring beyond expectation,& you helped!